When you buy Lotto Logic or Lottery Looper, the Lifetime Membership entitles you to all future upgrades and new versions of each particular product for absolutely nothing! Upgrades are always free! It literally is a one-time fee! Have the peace of mind and comfort of knowing that you will never be asked to pay again for upgrades or new versions. How do I change the software settings? If any rules (settings) for your lottery change, then all your old data is useless because the machines and balls have definitely changed. 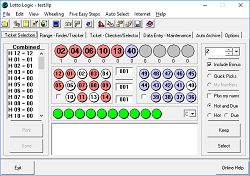 This is a Lotto Logic and Lottery Looper safeguard to prevent you from using any useless data. Start a new file with your new lottery rules (settings), and only use drawings since the change occurred. Where is the Lotto Logic Manual? Where is the Lottery Looper Manual? 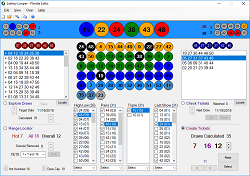 How many past entries should I start with for Lotto Logic? We recommend starting with 20 to 30 past entries from the date you start to use the Lotto Logic program, then begin tracking the best ranges. Please read the help file “Concepts and Strategies” for more in-depth explanation. How many past draws should I start with for Lottery Looper? Based on customer feedback, 10 draws is a perfect start. We’re here to help! Please use this contact form for all support.